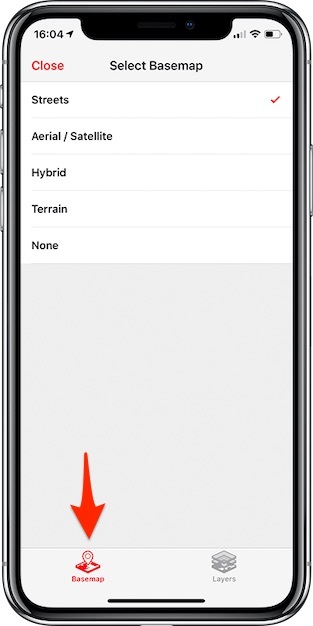 Details on accessing the included basemaps and custom map layers in the Fulcrum for iOS app. 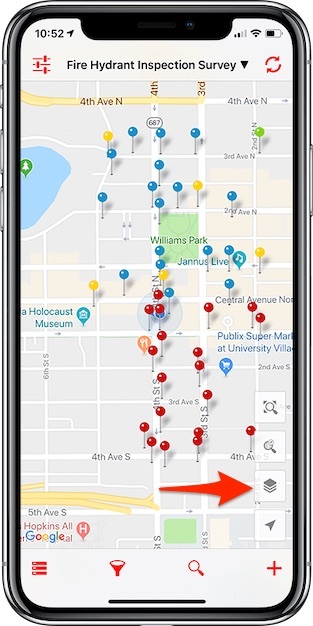 When working on WiFi or at least a 3G network you can choose from the list of Online Basemaps provided by Google or access the custom layers that you have added to your plan. The included basemaps options are Streets, High definition Aerial/Satellite & Hybrid (a combination of satellite and streets), and Terrain. The mobile apps have support support for two of the custom map layer options available. MBTiles can be used for offline and online use, Tile XYZ sources can be use for online layers. 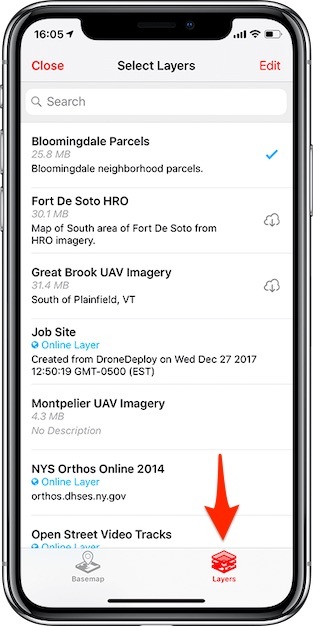 Be sure to download your offline maps over WiFi before heading out to collect data in offline environments since downloading these large files on your cellular plan uses your network data. MBTile layers can either be uploaded directly to the device or added to Fulcrum through the web app. On the map view is where you will find the options to select a basemap or load a layer. By default when you click on the basemaps and layers button will be be taken to the basemaps tab. Here you will find option to use layers provided by Google Maps. These basemaps will display at the lowest level and any layers that you select will display over top of the selected basemap. You can see the basemap selected by looking for the check mark to the right of the basemap. The layers tab is where you can access the layers that you have uploaded directly to the device or added to Fulcrum through the web app can also be downloaded to your device through here. You can also enable, disable, remove, or change the ordering of your layers. Multiple layers can be arranged on top of one another. To arrange the order of the layers tap the ‘edit’ button and then drag the layers into position. To download a layer, you will want to click on the download icon to the right of the layer. After it has downloaded, you can click the layer again to enable the layer. You can see which layers are enabled by looking for the check mark on the right of the layer row. To remove a layer, either swipe to the left and click the delete button or select ‘edit’ and tap the red circle to pull up the delete button. Be sure to download your offline layers over WiFi before heading out to collect data in offline environments since downloading these large files on your cellular plan uses your network data.